I can see how it didn't make any sense from your original point of view. Thank you for your understanding. That's not true. Optifine isn't even out for Forge yet. I just found this mod and love it! Thanks! I was using Journeymap but decided to try this one since they were not up on 13.2 yet. I'm not sure exactly why yet, but I like this better. It feels more snappier or something. Waypoint teleports also seem to work better, at least in my limited testing. Thanks for your work on this. Thank you very much! Teleports might work better in 1.13.2 because Mojang fixed them though (I'm not sure if they actually did). Can I translate into Brazilian Portuguese? Where should I send the file? GitHUB? I'm pretty sure it's already translated to Brazilian Portuguese. Would you like to improve it? It's already out. I'll soon add it on Curse too. Great mod, wa swondering if it's possible to change keybinds for the minimap? Yes, check the default controls menu. though I wish it had some features like Icons instead of Entity Dots, but great work so far! Thanks! I'm probably going to add it in the future. I just discovered this mod today and so far I'm enjoying it. It has some features in it that I wish Voxelmap did. But I have a question tho. I am using the 12.2 version, do you think you could add the ability to increase the "Entity Dots Scale" up to 4? I have low vision and the dots set at 2 is kinda still too small so I figure 4 would be best if that's possible? 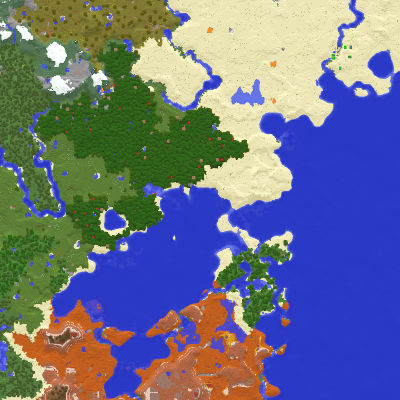 Also, reading the comments below, you mention something about you having a World Map mod that adds fullscreen maps, what would that be? That is one of my favorite I love that voxelmap has. Thanks! Can be done. The world map mod is called Xaero's World Map. It's not on Curse yet though.